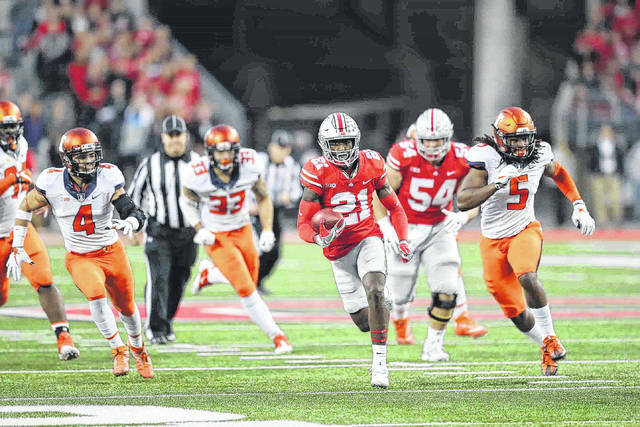 COLUMBUS — Beating Illinois was obviously the first thing on Ohio State’s agenda, but beating the weather was also in the game plan for the Buckeyes when they dominated the Illini 52-14 on Saturday. An ominous weather forecast that called for heavy rain and possibly thunderstorms by halftime was on coach Urban Meyer’s mind before the game and factored into how he approached the game and what he told his team. “The message in the locker room was to get out and get out fast, take care of the ball and execute the game plan,” Ohio State center Billy Price said. Meyer said he would have broken with his usual choice and would have gone on offense first if Ohio State had won the coin toss. 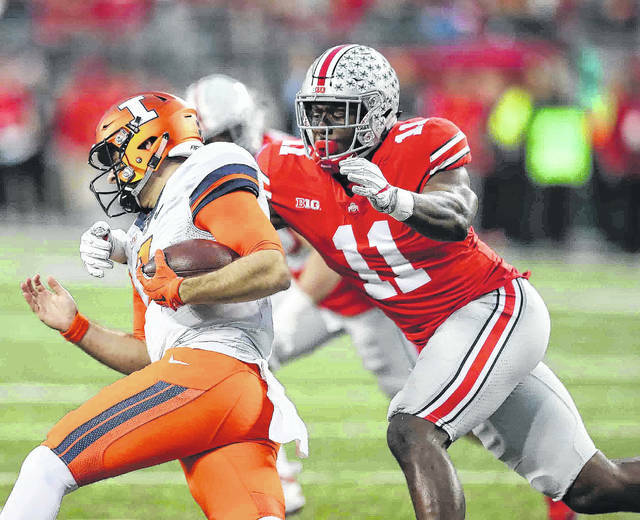 The rain took a while to arrive but Ohio State (9-2, 7-1 Big Ten) rained points on a young, glaringly overmatched Illinois team (2-8, 0-8 Big Ten) right away. Ohio State scored the first five times it had the ball – four touchdowns followed by a field goal. Illinois didn’t get a first down until its sixth possession of the game with 3:38 left in the first half. The Buckeyes rolled up 543 yards of total offense and held Illinois to 105 yards overall. The only score by Illinois came on an Ohio State turnover when Ahmari Hayes recovered a fumble by back-up quarterback Dwayne Haskins and returned it 53 yards for a touchdown with Ohio State leading 38-0 early in the second half. Starting quarterback J.T. Barrett and the first-team Ohio State offense had come out of the game with just under six minutes to play in the first half, but returned after Hayes’ touchdown cut the lead to 38-7. “I didn’t want it to turn into a clown show, which it looked like for a minute,” Meyer said. Ohio State’s win, combined with Michigan’s 24-10 loss to Wisconsin, clinched the Big Ten East Division title for OSU and guaranteed the Buckeyes a match-up with the Badgers in the Big Ten championship game regardless of what happens in the Ohio State-Michigan game next Saturday. “We celebrated for a quick minute. Now it’s time to put our laser lights on our rival,” Meyer said. The Buckeyes needed nine plays to score their first touchdown, which came on a 4-yard run by Mike Weber. After that, they needed only six plays, three plays, two plays to score their next three TDs. Barrett ran for a three-yard touchdown to raise Ohio State’s lead to 14-0. Mike Weber had a 43-yard run to make it 21-0 and Barrett connected with Binjimen Victor for an 11-yard touchdown pass to put OSU in front 28-0 after one quarter. Barrett’s touchdown pass was the 100th of his career. He is the only Big Ten quarterback ever to throw for 100 TDs. He was 11 of 19 for 141 yards and two touchdowns. Weber led Ohio State’s rushing attack with 108 yards. After a 33-yard field goal by Sean Nuernberger, J.K. Dobbins ran one yard for a touchdown that made it 38-0 with seven minutes left in the first half. Ohio State’s starters didn’t score immediately after they returned in the second half. But when Illinois fumbled a punt, it took only five plays for Ohio State to score again, on a 12-yard pass from Barrett to Marcus Baugh, for a 45-7 lead with 7:58 left in the third quarter. Haskins bounced back from the earlier fumble to throw a 22-yard touchdown pass to Victor with 11:41 left in the fourth quarter to push the lead to 52-7 before Illinois got a touchdown against the second team defense later in the fourth quarter. Illinois defenders give chase to Ohio State’s Paris Campbell during Saturday’s game at Ohio Stadium in Columbus. Ohio State’s Jalyn Holmes chases down Illinois’ Chayce Crouch during Saturday’s game at Ohio Stadium in Columbus. Ohio State’s J.K. Dobbins looks for running room while being pursued by Illinois’ Patrick Nelson during Saturday’s game at Ohio Stadium in Columbus. 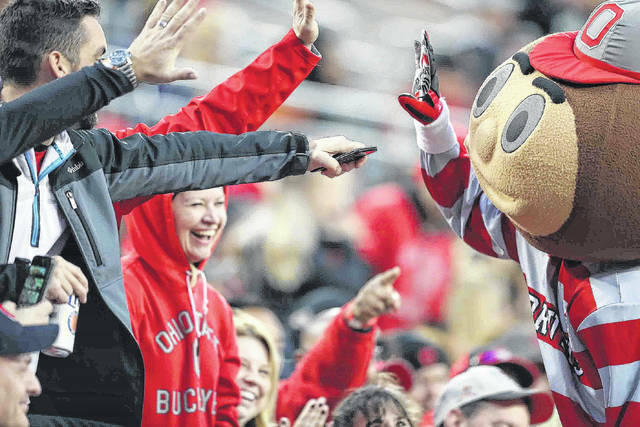 Fans interact with Brutus Buckeye during Saturday’s game at Ohio Stadium in Columbus.